Situated on Kona's iconic lava cliffs overlooking Keauhou Bay, guests relax, experience and create memories with family and friends. The Sheraton Kona Resort and Spa is located within a naturally landscaped lands that were once the birthplace and playgrounds of kings which offers guests a profound sense of place and storytelling that can be shared and appreciated across many generations. Considered the “Gateway to the Bay,” the Flying Fish outfitters store provides an all-access pass to fun and adventure where guests can have immediate access to paddle boarding, kayaking, fishing, surfing, boat tours and exploring the pristine reef. The ocean view restaurants partner with local farms and fishermen to serve only the freshest ingredients. Rays on the Bay is the world’s only restaurant where you can enjoy live music seven nights per week by fire pit and observe majestic Manta Rays in their natural habitat. For a sensory experience and cuisine of Polynesia, dine at the Haleo Lū‘au Dinner and Show. Under the stars, a weekly luau offers a colorful journey through history. Offering the most ultimate pool experience on the Kona coast, including the 200-foot lava tube water slide, hot tubs, sprouting fountains and our sandy-bottomed children’s play area. For other services and to learn about authentic Hawaiian culture, the resort includes cultural programs. In additionn, the Ho’ola Spa offers Hawaiian therapies and treatments including a healing Himalayan Salt Room and an oceanfront treatment patio. Gateway to Keauhou Bay: observe the majestic manta Rays. The ultimate pool experience on the Kona coast: a 200-foot lava tube water slide, hot tubs, fountains and a sandy-bottomed children’s play area. Ho’ola Spa offers a healing Himalayan Salt Room and an oceanfront treatment patio. The resort's guestrooms and suites feature original prints and fabrics by Hawai'i designer Sig Zane. All 508 nonsmoking guest rooms are newly refreshed with furnishings, carpeting, and flat-screen TVs. Each room and suite also features furnished lanais, high-speed wired and wireless Internet (surcharge), compact refrigerators, bathrobes, and Sheraton Sweet Sleeper Beds. 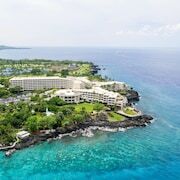 Sheraton Kona Resort & Spa at Keauhou Bay offers 508 accommodations with minibars and laptop-compatible safes. Rooms open to furnished lanais. Beds feature premium bedding. 55-inch LCD televisions come with premium digital channels and pay movies. Refrigerators and coffee/tea makers are provided. Bathrooms include shower/tub combinations with deep soaking bathtubs, bathrobes, slippers, and complimentary toiletries. Guests can surf the web using the complimentary wired Internet access. Business-friendly amenities include desks and complimentary newspapers, as well as phones; free local calls are provided (restrictions may apply). Additionally, rooms include complimentary bottled water and hair dryers. Housekeeping is offered daily and hypo-allergenic bedding can be requested. Ainakai Restaurant - Open-air restaurant with bay views. The restaurant features a breakfast with tropical buffets, island juices, fresh fruit, Kona coffee and made to order omelets and waffles. Breakfast is served daily between 6:30 AM and 10:30 AM. Rays on the Bay - Offers views of the ocean and live music. The bar serves fresh local seafood, artisan pizza, farm-to-table cooking, beer and a variety of rums. Holua Bar - Located next to the Manta Ray super slide and pool. Menu includes salads, wraps, and sandwiches. The bar also serves tropical cocktails and the full line up of micro-brewed beer from the local Kona Brewing Company. The bar is open from 11:00 AM to 6:00 PM, food service until 5:30 PM. Keauhou Bay Coffee Company - Located poolside. Offers gourmet coffees, pastries, Italian gelatos, and light snacks. Open from early morning until early afternoon; re-opens for dinner. Haleo Luau Dinner & Show - For a unique Hawaiian cultural and dining experience, reserve your place at the table for Haleo lu`au dinner and show on the Hawaii Lawn Monday evenings; reservations required. Haleo Luau and Dinner Show - Local dancers and musicians interpret the legends of Hawaii and Keauhou at sunset. Guests dine on a dinner buffet featuring traditional Hawaiian foods. Manta Talks - Presentations by researchers teach guests about the manta rays that are unique to the Keauhou area. Held nightly Monday - Saturday. Oudtoor Movies are shown Wednesday - Friday evenings. Guests can watch the shows from lounge chairs or from inner tubes in the pool. Rollaway/extra beds are available for USD 70.0 per night.